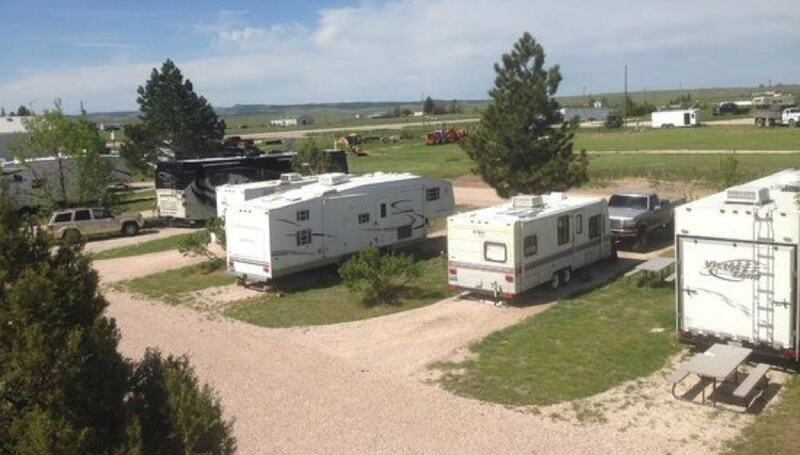 Our stay at Prairie View Campground was brief, only two nights on our way to Colorado. This is another campground we chose largely because there weren’t any others nearby. It was a convenient stop half way between the Wyoming Badlands and Rocky Mountain National Park. Our stay was so brief that I forgot to take pictures of the campground. This is greener than it was in September when we visited. This is the first time we’ve booked at an RV park and they simply said, “Just park in any available spot when you get here.” Indeed when we arrived around 2:30 the manager was out so we just picked a spot and settled in. It’s a small park, some 20 lots or so, and thus it was easy enough to get situated. The proprietor did arrive later in the day and gave us a 10% off-season discount without us asking for it. He seemed a nice enough fellow. I can’t say as many good things about the park itself. While it wasn’t a mess, it wasn’t a pretty location either. There are some prairies adjacent to the property, there are also some storage yards for u-haul trucks and other old and junky looking equipment. In the time we were there we saw at least 3 other RVers pull up, look around, and then just leave. There were some rabbits at the site, Trail is badly allergic to rabbits. The bathrooms on sight were clean enough but old and in disrepair. Lots of peeling paint, broken fixtures, and faint musty smells. I didn’t bother to use the showers but the plumbing seemed to work fine. As far as amenities go, the best they offer is an on-site espresso shop, but it was closed for the season by the time we arrived. They do have a laundry but it is best described as a closet crowded with a few old machines. None the less, the hookups all worked and the site was fairly level so I can’t say it was a bad park, just one that offers little more than a convenient place to park for a night or two. The price is fairly average for an RV Park, but the park is below average quality so I wouldn’t say it’s a good value.